Beginning in the early 1830s, the US government approved the forced removal of the Choctaw Indians from the southern states to present-day Oklahoma. The Choctaw Trail of Tears (as it became known) and other displacement efforts against the tribe took the lives of roughly 1/4 of the Choctaw Indian Nation. The government had agreed to provide food for the long journey, but after numerous setbacks the military ran out of rations and clothing. Children and the elderly suffered in particular from the ensuing starvation and disease. Fast forward 16 years. Barely settled in Oklahoma, the Choctaw Nation received word of millions of people across the sea who had lost their potato crop to blight. They had never met the largely-impoverished Irish; but in 1847, displaced and disenfranchised, they took up a collection and gathered $710 for the Irish people – a fortune that required everyone give all that they had. They sent the money to Memphis – coincidentally one of the cities where the military had gathered them to start the Trail of Tears. 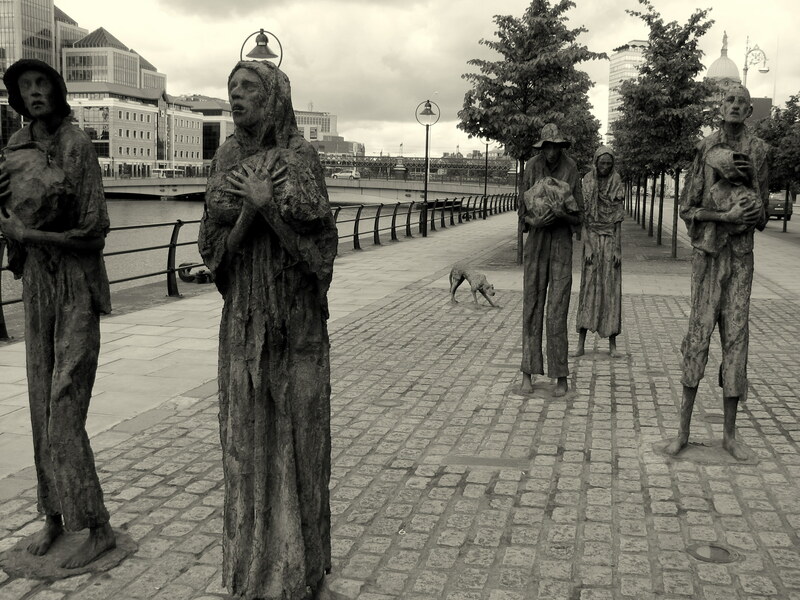 From there it made its way to Irish famine victims and into Irish legend for years to come. In honor of the Choctaw Nation’s generosity, a group of Irish men and women retraced the Trail of Tears backwards from Oklahoma in 1992. They used the memorial journey to raise funds for famine relief in Somalia. Today another famine oppresses Somalia and surrounding nations. And while world economies struggle, this story must remind us that generosity goes beyond bank account balances and the safe comforts of prosperity. Generosity can be born out of hardship – perhaps it must be. This relationship between two starving peoples made me realize yet again how easily I overlook the traumas that Native Americans endured in this country and how cheated we are not to know more about their cultures. And it made me keenly aware of my greed in the face of famine. I am a descendant of Irish and Jewish relatives – two groups that have known hunger and displacement quite well. Do I honor my ancestors and the suffering they endured with even a fraction of the selflessness that the Choctaw Nation demonstrated? Are you Irish? Chinese? Russian? If you have never experienced starvation, your ancestors probably have. Remember them as the Choctaw remembered their lost thousands – feed today’s famine victims. Check out this children’s book about the Choctaw’s generous gift – reviews call it a culturally respectful must-read for Irish-American kids. People groups seem to be pretty good at feeding themselves as evidenced by the fact that the Somalis were once food self-sufficient but war, violence, and brutality usually brings starvation with it. This is a great article, and a topic me and my classmates were only discussing yesterday. It’s amazing how people, no matter how poor, come together to help in times of need. There are many current day examples too, for example when my friend was in Ethiopia this summer there were groups of students fundriasing for victims of the Tsunami in Japan!! And when I was in Korea this year, people were fundraising for the “poor victims” of the earthquake in New Zealand. Pretty amazing. I’m glad you enjoyed it! Those are beautiful stories! I’ll bet there are many examples know one even knows about.